This article is about adding task link and option in Sitecore control panel. Login to Sitecore Desktop mode. Add a new task page “My Task Page” under item “/sitecore/content/Applications/Control Panel” which is inherited from “/sitecore/templates/Sitecore Client/Tasks/Task page”. You can add Task Link and Task Option under Task page. Add a new task link “My Task Link” under item “/sitecore/content/Applications/Control Panel/My Task page” which is inherited from “/sitecore/templates/Sitecore Client/Tasks/Task link”. Add a new Task Option “My Task Option” under item “/sitecore/content/Applications/Control Panel/My Task page” which is inherited from “/sitecore/templates/Sitecore Client/Tasks/Task option”. As you can notice, there is vacant space in My Task Page region. So to remove this, I just move down “My Task Page” under “Reports” item in CORE database content tree. I hope you like this quick Sitecore lesson. Stay tuned for more Sitecore related articles. In one of my project requirement, I have to add buttons in Sitecore Experience Platform screen. Add required number of button items under "/sitecore/client/Applications/Launchpad/PageSettings/Buttons/My LaunchPad Group" which is inherited from "/sitecore/client/Applications/Launchpad/PageSettings/Templates/LaunchPad-Button"
I was looking to my designer to update one Sitecore image and I come to know that he is on leave. I decided to edit it myself as I can’t wait for a day. I tried to google some of the image editing tool but to my surprise there is already one image editing tool available in Sitecore. This is something new to me as a hidden gem in Sitecore. Though there is MS-Paint is available in all windows computer which have lots of other features. But this tool allow you to edit directly in media library itself online and without need of any other image editing software. So for me this is a quick and handy tool. 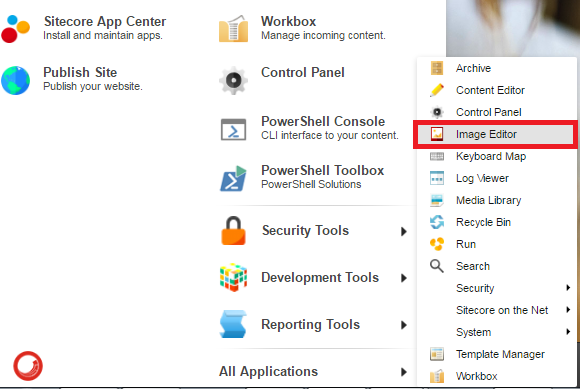 I hope Sitecore provide more and more features in Image Editor in upcoming releases.